Many administrators use box.com so they can host their documents online. Once your documents are hosted online you can create links to those documents to include in your GLM forms and processes. Hosting your documents online gives you the ability to access them from anywhere and makes changes to them as needed. 1. Open your browser and type www.box.com into the search bar. 2. Click “Get Started” to create a new account. 3. Select a Business or Individual. The “Individual” plan is free and can host up to 10 GB of file. 5. Confirm your email address. You will receive an email from noreply@box.com. If you do not receive this email in your inbox, check your junk folder. 6. You will then be prompted to decide whether you plan to use your account mostly for personal use or for work. You can click the Skip link at the bottom of the page if you would like. 7. 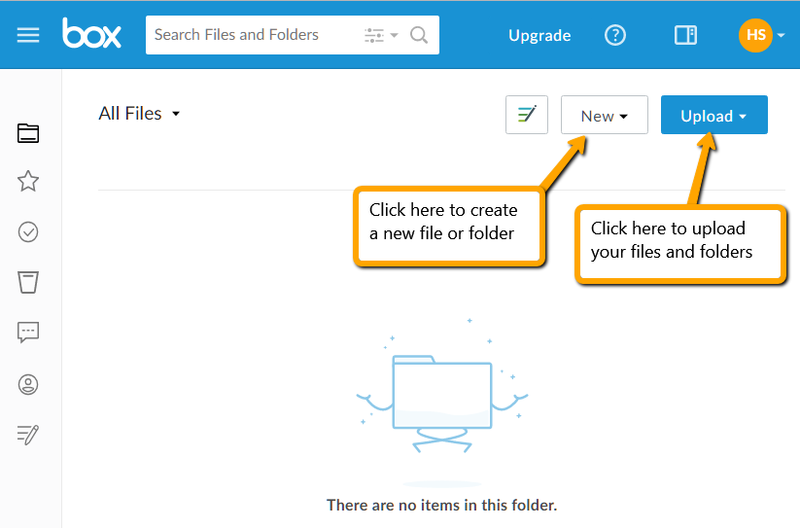 Upload your files and folders. 8. After you have uploaded your files you can link them to your GLM forms and processes. Click “Share” on the line with the file name that you have uploaded to box.com. Highlight and copy (Ctrl+C) the url in the box that pops up OR click the Copy button which will automatically copy the link. Open your GLM site and paste this url into the Rich Text Editor in your forms or process description. Click HERE to learn how to link text in the Rich Text Editor.